You could book yourself into a run-of-the-mill hotel room, or you could give your dreamtime the perfect backdrop with these quirky and unusual places to stay. Discover what life is like as an Inuit in one of these ‘proper’ igloos. Just outside Quebec City, Village Igloo’s igloos are handmade of packed snow and given floors of soft pine branches. If you prefer a little more luxury, check out Quebec’s Hotel de Glace’s 44 rooms and suites, cut from ice and snow and filled with dazzling ice artworks. Obviously only available in winter. The enormous Sheraton Huzhou Hot Spring Resort is shaped like a magnet and positioned over the waters of Lake Taihu, in Huzhou. It’s also known as the Moon Hotel – by night, the hotel’s horizontal stripes of light shimmer on the water below, creating a big ‘O’, which is the shape your mouth will make when you see it too. Sleep 155 metres beneath the Earth’s surface in the Underground suite of the Sala Silvermine, which claims to be the world’s deepest bedroom. This is one of the best-preserved mine settings in the world. It’s cold and damp but the suite is warmed to 18 degrees, and there’s really nothing like it. 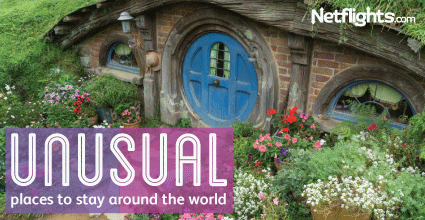 Make believe you’re bedding down in The Shire at The Hobbit Motel, just one of a few quirky accommodation options at Woodlyn Park. There are round windows and doors, and a grass roof. You’ll be glad to hear that the beds are human sized though. Forget the usual tented lodges next time you go on safari and head to the luxurious Dodo’s Folly, part of Hippo Point, a private wildlife conservancy. It’s an eight-storey pagoda-style tower with a writing room, meditation room and an incredible balcony with views of giraffes, hippos and zebras roaming beneath you. The Huilo-Huilo Biological Reserve in the Chilean Patagonian Rainforest prides itself on its commitment to sustainable tourism, and its accommodation options are just as remarkable. Hotel Nothofagus is built around a tree, which reaches up through its atrium. It’s a beautifully textured structure that follows the forms of nature and gives you monkey-eye views of the trees from your bed. The Montaña Mágica Lodge pretends it’s a volcano with a waterfall gushing from its peak, and down the lush vegetation that clings to its sides. El Cosmico is a nomadic hotel, campground and generally cool hangout in the high plains desert of Texas. This is the place to tune in and drop out. There’s a range of accommodation to pick from, including vintage trailers, tepees, a yurt and safari tents, but what makes this place really different is the design of these places. El Cosmico is an on-going adventure in design and building by a visionary team of renowned architects, builders, artists and students.